Investigators believe an explosion at a spa in southern California that killed one woman may have been intentional, police say. 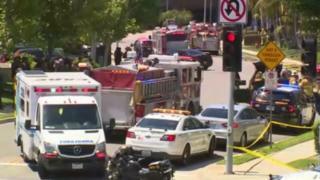 Tuesday's blast at the two-storey building in Aliso Viejo, south of Los Angeles, also injured two people. Local authorities say they suspect the device may have been delivered by parcel, but they do not know how it entered the building. Police have identified the woman killed by the blast as the owner of the spa. Police say it is unclear if Ildiko Krajnyak, 48, was targeted. At a news conference on Wednesday, FBI investigators said the explosion was "not an accident", and was probably caused by an explosive device. Items found at the scene "were not consistent with items that would be used as a day spa", a sheriff's official said. "At this point, our working theory is that this explosion was caused by a device," FBI officer Paul Delacorte added. Evidence is currently being sent to the FBI laboratory in Virginia for further investigation. Authorities say they do not know how the suspected package bomb entered the building, but in a statement, the US Postal Service said it was not sent through its mail. "The US Postal Inspection Service, the federal law enforcement branch of the US Postal Service, has determined the package in question did not go through the Postal Service mail system," the agency said earlier on Wednesday. Earlier on Wednesday, FBI investigators searched a home in Trabuco Canyon believed to be where the victim and her estranged husband had been living. The couple were in the process of losing the home to foreclosure, CBS News reported, citing court records. Nearby buildings in the area were damaged by the blast, which destroyed the first floor of the medical building where the spa was located. A nearby nursery had to be evacuated by emergency officials. "When I was playing outside I heard the big crash, I thought it was a garbage truck but it was a building that smashed," six-year-old Kingston Dik told KNBC-TV. The ground shook and it felt "almost like an earthquake, but a big earthquake", one witness said. Dong Shin told CNN that he had seen "fire, smoke, insulation popping out of the walls, a lot of scared people running around, a lot of commotion". Mary McWilliams said that after the explosion she saw two women emerging from the building with obvious injuries. "I saw two women come out full of blood, hair singed, glass stuck to their hair, glass stuck to their bodies. Their skin was burned and peeled back," she told CBS. The sheriff's department has stressed that the investigation remains at an early stage, and add that it is being assisted by the FBI and the Bureau of Alcohol, Tobacco, Firearms and Explosives (ATF).